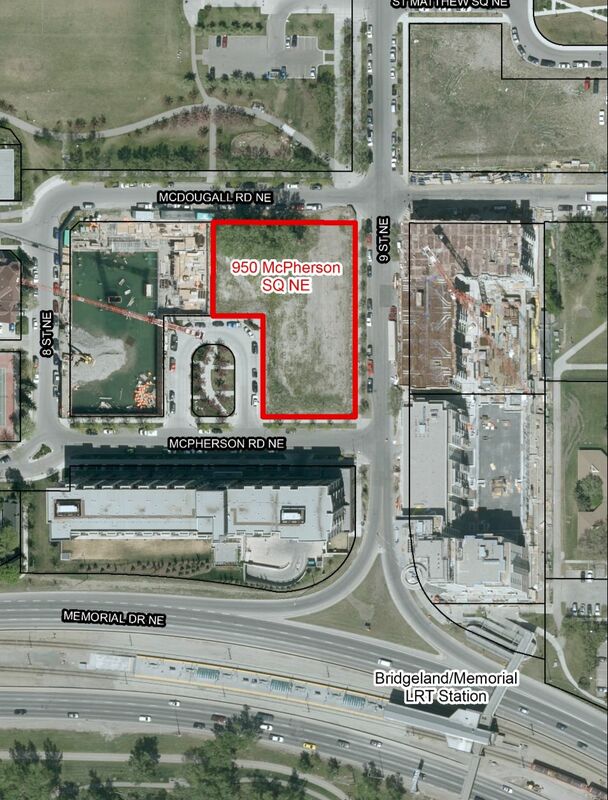 To provide more flexibility for future development and accommodate the needs of Bridgeland-Riverside, The City’s Real Estate & Development Services has applied for a land use redesignation for 950 McPherson Square N.E. The City’s Real Estate & Development Services group has applied to The City’s Planning and Development department for a land use redesignation of City-owned property 950 McPherson Square N.E. in the community of Bridgeland-Riverside. 950 McPherson Square N.E. is part of The Bridges neighbourhood, a city-developed transit oriented development project. The land site is approximately 150 metres north of the Bridgeland/Memorial LRT Station. The proposal is to redesignate the land to allow for a maximum height of 34m (up to 10 storeys) containing commercial storefronts with residential above. The proposal is to redesignate the land from the current Direct Control District 41Z2002 Site 13 (based on the previous Land use Bylaw 2P80) to Multi-Residential – High Density Medium Rise (M-H2) District. The Bridges is an award-winning multi-residential and mixed use redevelopment project owned and managed by The City of Calgary. It is located in the inner-city community of Bridgeland-Riverside and is one of the best examples of Transit-Oriented Development in Canada. When its three phases are complete, The Bridges will be home to approximately 2,000 to 2,500 residents. The Bridges is designed as an urban village that respects, enhances and takes cues from the surrounding neighborhood while creating a distinct environment on its own. Pedestrian-friendly streetscapes and a regional pathway provide direct access to the adjacent Bridgeland Light Rail Transit (LRT) station, recreational amenities, main street retail stores, downtown Calgary, the Bow River, the Calgary Zoo and the River District. In October and November we asked you about the strengths and weaknesses of the application, what you value in your community, and any other suggestions or concerns you may have with this proposed redesignation. The input will be used to strike a balance between the proposal, community values, the area redevelopment plan and the Municipal Development Plan to modify the proposal as appropriate. Look at the information boards presented at the Open House on October 24th for additional information. Please review the What We Heard report to see the feedback received at the Open House and online. What do you value most in the Bridgeland-Riverside community? What building height would you prefer on this site? While we are asking for the community’s thoughts on this project, we cannot commit to implementing everything that is suggested. We will report back on “What We Heard” from the public and “What We Did”, how we used the information collected. The plan to redesignate this site of City-owned land must balance many factors including community values, the area redevelopment plan and the Municipal Development Plan. In January 2017, City Administration will prepare a report to Calgary Planning Commission with a recommendation to change the land use or not. June 2016 – Redesignation application received by The City’s Planning Department. Sign up to receive project updates directly to your email, subscribe to our mailing list.